Most over-the-counter cough syrups present no serious risk to you or your baby while breastfeeding. However, according to advice from the Food and Drug Administration, you should always speak to your doctor before taking cough syrup or medication while nursing. Chemicals from cough syrup can pass into your breast milk. Your doctor or pediatrician can advise whether a particular brand is suitable for your situation. Cough syrup is designed to soothe an itchy, inflamed throat, as well as offer a mild anesthetic effect. You can buy most forms of cough syrup without a prescription. Generally, cough syrups are classified as antitussives. These loosen mucus and phlegm in the throat and lungs. Active ingredients may include codeine, benzonatate, pseudoephedrine or carbetapentane. The ingredients vary, depending on the brand. Two less-effective substances, guaifenesin and dextromethorphan, appear safe for use during breastfeeding, according to the Kentucky State Breastfeeding Coalition. 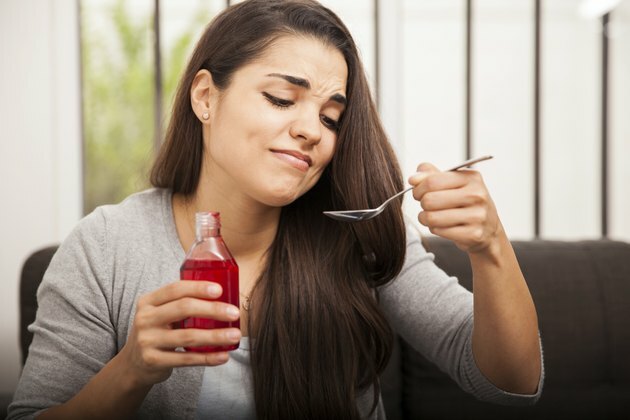 Some cough syrups contain codeine. Codeine can easily pass into your breast milk. Most women metabolize codeine at a steady rate, meaning that only very small amounts contaminate the breast milk. However, according to the U.S. National Library of Medicine, some women have problems with fast codeine metabolism, resulting in higher concentrations of morphine in the blood. This can seriously harm a nursing infant. Benzonatate is another form of antitussive found in popular cough syrups. Familiar brands containing benzonatate include Tessalon and Zonatuss. The Breastfeed Coalition lists benzonatate as a substance to avoid while breastfeeding. Similarly, MedlinePlus suggests speaking to your doctor before taking cough syrup with benzonatate. Some patients report side effects after large doses of benzonatate. These range from nausea and drowsiness, to difficulty breathing and even hallucinations. Almost any medication you take will transfer into your breast milk, even if at extremely small doses. If you choose to take cough medicine while breastfeeding, then dosage is highly important. Taking more than listed on the package or recommended by your doctor could increase the medication concentration in your milk. This increases the chance of harm to your infant. Also, do not mix medications at the same time as this may increase their effect. Can You Take Cough Drops When You Are Pregnant? What Are the Dangers of Mucinex for Children?